Why does my bin need to be kerbside on collection day? Where should I keep my bin on non-collection days? What happens if bins are left out early or on the wrong day? What can I do if I have more waste than normal or it doesn't fit in the bin? What can I not put in the bin? How do I dispose of clinical waste? Why do some areas have black sacks? In order for Cityclean to utilise resources as efficiently and economically as possible, the Council has set guidelines for the refuse and recycling rounds. This is for the benefit of both the resident and the crews. It means that all crews will collect bins and boxes from the same place for every household. This aims to reduce reported missed collections and improve our service and your value for money. Whilst it may seem to be only a few steps to collect from a driveway or a front door, then over the course of the day this can add a substantial amount of time on the crews’ workload, as they collect from over 1000 properties every day. Bins and Boxes should be kerbside from 6.00 am to ensure they are collected. You should not leave your wheelie bins on pavements on non-collection days as this can cause problems for people with pushchairs and disabilities. Bins and boxes should be stored on your property on non-collections days. What happens if I leave my bin out early or on the wrong day? What can I do if I have more rubbish than normal or if it will not fit in the bin? Wheelie bins were introduced to improve the efficiency of the service, safeguard the health and safety of our operatives, ensure the containment of rubbish and reduce the amount of waste going to landfill. To achieve these, only refuse placed within the wheeled bin will be collected. Over half of domestic waste can be recycled and there is no limit on how much recycling the crews will collect. Households who produce excess rubbish are responsible for disposing of this in a safe and legal manner. 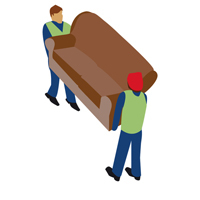 You can either take extra waste or bulky items which cannot fit inside the bin to your local recycling centre or our bulky waste collection service collects items which cannot be recycled or disposed of in your household boxes or bin. We run 25 collections per day and at the end of the day the items are taken for recycling where possible or alternatively for safe disposal. How can I dispose of clinical waste? By law only certain types of clinical waste my be put in a household dustbin - small quantities of sanitary waste such as disposable bed pans, bed pan liners, incontinence pads, stoma bags and urine containers may be put in the dustbin providing there is no risk of any infectious material being present. A third of what we throw away is food waste. Food composters, wormeries and standard composters take food and garden waste and break it down into high quality compost. We do not currently collect food waste directly from households due to the different specialist collection methods needed. Around 1/3 of housing in the city are flats, and we would not be able to run a food waste collection service from them due to the communal nature of their collections. When designing a sustainable cost-efficient service we need to take into account participation rates, types of property, cost and value for money, to ensure the service is suitable for the city. Our projects team continue to explore options and funding. Instead we offer subsidised compost bins to all residents to encourage composting at home, including kitchen caddies which allows residents to make use of their own compost and is better for the environment. Visit our home composting page for advice on the best option for you and details of discounted composters, food waste digesters and wormeries or check where your nearest public community composting site is. Otherwise food waste for the time being needs to be disposed of in general refuse. What can I do with garden waste? Currently residents can dispose of their garden waste by composting at home. Visit our composting page for advice on the best option for you and details of discounted composters, food waste digesters and wormeries. The council is offering a new garden waste collection service in some areas of Brighton & Hove. Residents who sign up will pay £52 a year to have garden waste collected on a fortnightly basis in wheelie bins from their properties. The garden waste will be turned into compost at a specialist facility. The scheme would help increase the city’s recycling rate which is currently around 25%. More details of this service will be available before the launch in May 2016. Why do some areas still use bin bags? 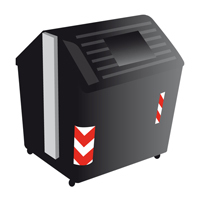 Black refuse bags are used in areas of the city where wheelie and communal street bins are not suitable. It is important that black refuse bags are not put out early for collection as this can cause litter and obstructions. Brighton & Hove has over 700 communal street bins, mainly in the city centre. They are used in areas where properties lack space to store refuse; where people used to have to put black bags out. The bins help keep our streets clean by containing waste effectively and allowing residents to dispose of their waste whenever is convenient to them. Visit our service information page or let us know if you have any further questions about our services through our online report form - these are passed directly to the customer service team. You can also check out our frequently asked questions about recycling.